MISSOULA, Montana, May 3, 2013 (ENS) – The U.S. Fish and Wildlife Service is preparing to remove a population of grizzly bears from the Endangered Species Act, under which they are now listed as a threatened species. On Thursday, the Service issued for public comment a draft conservation strategy for grizzlies in the Northern Continental Divide Ecosystem. The outcome is expected to be a post-delisting management plan for the bears and their habitat in this ecosystem. The Northern Continental Divide Ecosystem in northwest Montana is one of the last strongholds of the grizzly bear, Ursus arctos horribilis, in the lower 48 states. Of the six established grizzly bear recovery zones, the NCDE is the third largest in area, potentially harboring the greatest number of grizzly bears, and is the only zone contiguous to a strong Canadian grizzly bear population. It is the goal of the agencies implementing this conservation strategy “to maintain a genetically diverse NCDE grizzly bear population with at least 800 grizzly bears,” the Fish and Wildlife Service states in the draft document. “We will achieve this goal by including specific standards to document a widely distributed population, a high adult female survival rate, and sustainable mortality limits that will not result in long‐term population decline,” the Service states. 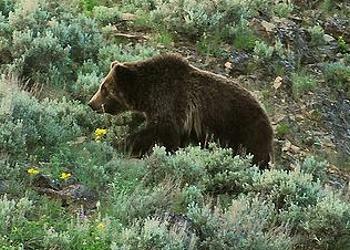 Since their listing as threatened in 1975, federal agencies say the NCDE grizzly population has increased in numbers and distribution due to the protections of the Endangered Species Act and state, federal, and tribal partners who have implemented recovery actions, coordinated research efforts, and improved habitat management. 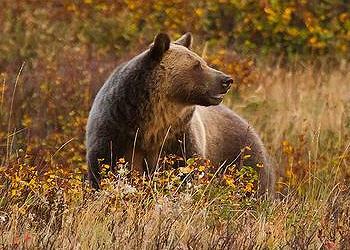 In 2004, scientists estimated that there were 765 grizzly bears in the Northern Continental Divide Ecosystem. The most recent scientific estimate shows that this population increased by about three percent a year during the eight years from 2004 to 2011, yielding a 2011 population estimate of 942 bears, the draft strategy states. “We developed this strategy because maintenance of a healthy, recovered grizzly population depends on the effective continuation of many partnerships to manage and conserve the Northern Continental Divide Ecosystem grizzly bear population and its habitat,” said Noreen Walsh, Mountain-Prairie regional director. “By involving the public, we aim to arrive at a scientifically-based strategy that not only ensures the persistence of grizzlies in the Northern Continental Divide Ecosystem, but also works for the people living in the places that grizzlies call home,” she said. The population of grizzly bears in this ecosystem “is contiguous with grizzly bears in Canada, resulting in high genetic diversity,” the draft strategy states. Erin Edge with the nonprofit Defenders of Wildlife, says connections between grizzly populations on both sides of the border and throughout the entire ecosystem must be encouraged. If the NCDE population of grizzlies is delisted from federal protection, under the draft conservation strategy, the bears and their habitat will be managed using a approach that identifies a Primary Conservation Area and three additional management zones similar to the approach used now. The key to public support and successful management of grizzly bears is to balance multiple land uses, public safety, and careful consideration of grizzly bear needs. Human‐caused mortality is the limiting factor for nearly all grizzly bear populations in the world and this conservation strategy aims to manage mortality at sustainable levels through habitat protections that minimize mortality risk while emphasizing conflict prevention, conflict response, and decisions grounded in scientific data and monitoring. The Montana state plan is integrated into the strategy as are relationships with national forest and national park plans. The Service expects signatories of this conservation strategy, such as the land management agencies, to incorporate its habitat standards and guidelines into their management plans.